A 66-year-old Gary, Ind., woman has become the first person in the country to receive an innovative mechanical heart pump that is the smallest and lightest of its kind. 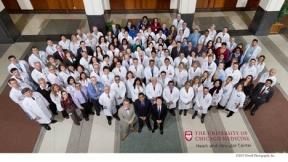 Physicians at the University of Chicago Medicine implanted a HeartAssist5 left ventricular assist device, a tiny electric pump that boosts the circulation when the heart’s left ventricle can no longer function, into Dorothy Duncan on February 16th. The LVAD pump is 2.7 inches long and 1.2 inches wide and weighs 3.2 ounces. The next smallest commonly used LVAD pumps weigh 5.1 and 9.9 ounces. “Before the surgery, I couldn’t catch my breath, just walking to the bathroom,” Duncan reported three weeks after her surgery. “Now I can get around pretty good. I feel a lot better.” Approximately 6 million people in the United States suffer from heart failure, the leading cause of hospitalization in people older than 65, and an estimated 550,000 new cases of heart failure are diagnosed each year. Nearly half of heart failure patients die within five years of diagnosis. With a waiting list for heart transplants of around 3,500 and fewer than 2,500 hearts donated annually, devices that can serve as a bridge between heart failure and transplant are needed. 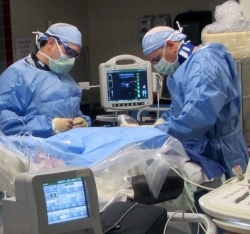 Left: UChicago Medicine cardiologists Nir Uriel, MD, (right) and Gabriel Sayer, MD, (left) determine Duncan’s optimal flow rate and program it into the device in a cardiac catheterization laboratory.